Coca-Cola Great Britain (CCGB) has announced the next step in its strategy to help people reduce their sugar intake – a new and improved sugar-free Coca-Cola which will be in stores this summer. ‘Coca-Cola Zero Sugar’, which will replace Coke Zero, will taste even more like the original Coca-Cola (Coca-Cola Classic), but without sugar, and will be supported by a £10 million marketing campaign designed to get more people to choose no sugar. The new drink is backed by CCGB’s biggest marketing investment in a new product launch for a decade and will feature TV, out of home, digital advertising and experiential. The multi-million pound marketing campaign will encourage consumers to try the new and improved Coca-Cola Zero Sugar by highlighting that it ‘tastes more like Coke and looks more like Coke’ than the original Coke Zero. This move is a deliberate attempt to change the mix of the company’s portfolio between sugar and no sugar drinks and is the latest action to result from the company’s £30 million reformulation and new product development programme. Replacing Coca-Cola Zero which was launched in 2006, new ‘Coca-Cola Zero Sugar’ is the result of years of recipe development and innovation. As well as the improved taste, the new name – Coca-Cola Zero Sugar – and packaging will make it even clearer to consumers that the drink is sugar-free. 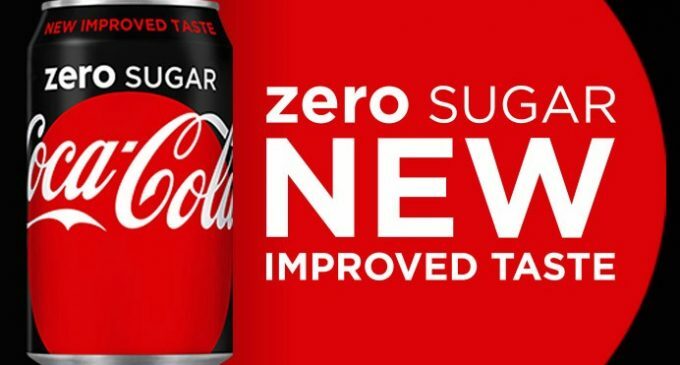 This decision was informed by consumer research conducted last year which showed that five in ten people did not know Coca-Cola Zero contained no sugar. In addition to the new recipe and taste, Coca-Cola Zero Sugar will have a new look in line with the company’s ‘One Brand’ marketing strategy. The new design incorporates the Coca-Cola red disc which has become a signature element of the brand, synonymous with great taste. By extending it to Coca-Cola Zero Sugar the new pack is designed to encourage people who love the taste of the 130-year-old original to give the zero sugar version a try. The move is the latest in a series of actions taken by CCGB to promote moderation and choice and help people reduce their sugar and calorie intake. As a result of moves by manufacturers to change recipes, introduce smaller packs and invest more in marketing no sugar options, soft drinks is the only food and drink category from which the sugar purchased by British households is decreasing – by 13.6 per cent in the last five years. Coca-Cola Great Britain is responsible for marketing 18 brands and over 82 products to consumers across Great Britain. Led by Coca-Cola, one of the world’s most valuable and recognisable brands, the company portfolio includes Fanta, Sprite, Dr Pepper, Oasis, glaceau vitaminwater, glaceau smartwater, Schweppes, 5 Alive, Lilt, Kia Ora and Powerade.